Alamo DVD Solutions specializes in converting, transferring, duplicating media to DVD. Alamo DVD Solutions LLC. provides personalized support for businesses, families and individuals with fully edited, authored and indexed, digital productions. Whether it is to transfer your VHS tapes to DVD, preserving or archiving photographs, videos or digital media, creating and distributing company training, advertising or operating materials, we can provide you with reliable digital media solutions. Create a priceless keepsake of any occasion on DVD using your photos, videos, slides and film. We add that special touch, including titles, captions, special effects, graphics and your music to bring the presentation to life. 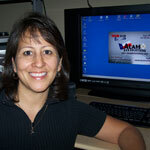 Carol Rodriguez is the Producer of Alamo DVD Solutions LLC. located in Live Oak, Texas. For most of Carol’s life she has had the dream of owning a business like this. She started out providing this service for friends and family before investing in this business and the equipment that provides the latest digital technology available on the market today. Imagine creating a Digital Photo Scrapebook on DVD using your photos, videos, slides, film and documents. We add the right music, special effects, titles and graphics to bring the Digital Scrapebook to life. A great way to share your memories with family and friends. To find out more about how we can get started on your Digital Photo Scrapbooks to DVD click more. Fact: Videotape will begin to significantly degrade and lose picture quality in as little as twelve years. Fact: Pre-recorded DVD outsells VHS by 4 to 1! National retailers are actually discontinuing the sale of all VHS products. Fact: Images on DVD last up to 100 years, ten times longer than videotape. You should transfer all of your VHS tapes to DVD and save those precious memories for all family generations to have. NBC news Video on tape transfers. What can I do with a DVD? Here are a few examples of DVD uses. The possibilities are almost endless.